This indeed sounds like an inspirational story of magical transformation. Nested on top of a serene hillock, surrounded by a quiet residential neighbourhood in Chatsworth, is a towering source of spiritual knowledge that invigorates the entire vicinity with its resounding spiritual energy and bestows peace, happiness and prosperity to all who enter it’s inviting gates…. 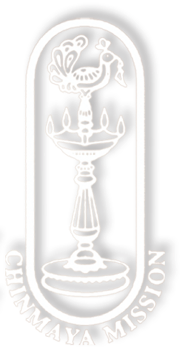 This is the Chinmaya Mission Centre of South Africa. Established in 1980 after the maiden visit of Pujya Gurudev Swami Chinmayananda, the ashram was built to bring about a spiritual revival among the local Hindus. The Durban centre has been fortunate to witness the visits of Pujya Gurudev Swami Chinmayananda, when the satsang hall used to be packed with large crowds who thronged to listen to his powerful and inspiring discourses in flawless English. Gurudev first visited Durban for a Geeta Gyan Yagna in 1980, and then visted again for another Geeta Gyan yagna in September 1987. These visits of Gurudev had a great impact on the people of South Africa. Over the years, the activities of the Mission started growing gradually. 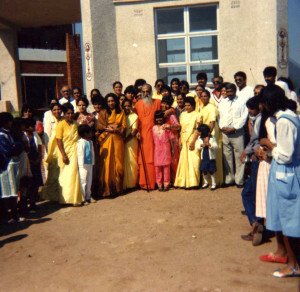 After Gurudev’s Mahasamadhi in 1993, the present spiritual head of Chinmaya Mission worldwide, Pujya Swami Tejomayanandaji visited South Africa for the first time in June 1996 when he delivered talks on Tulasi Ramayana in the Durban Ashram. His subsequent visits were in year May 2000, Aug 2001, Aug 2004 and Oct 2007, in all of which Swamiji gave very inspiring talks and enthralled the audiences in Durban and Johannesburg. In October 2012, the citizens of Durban were extremely blessed to revel in the divine presence of Pujya Swamiji, and benefitted from his soul-stirring discourses on Tulsi Ramayan. Swamiji graced the momentous consecration ceremony at the newly built Chinmaya Shivam Temple at the Durban Mission Ashram. South Africa and its people have been privileged to get the blessed opportunities to witness Swami Tejomayananda’s grace and benevolence during his visits to the country. Despite having a majestic structure and a sprawling premise, the ashram in Durban missed the presence of a resident Acharya who could nurture the infrastructure with divinity, saintliness and grace. This void was filled in 2006 after the arrival of the present Acharya – Pujya Swami Abhedananda. Growth is the insignia of life. When growth is stunted, life begins to wean itself away. 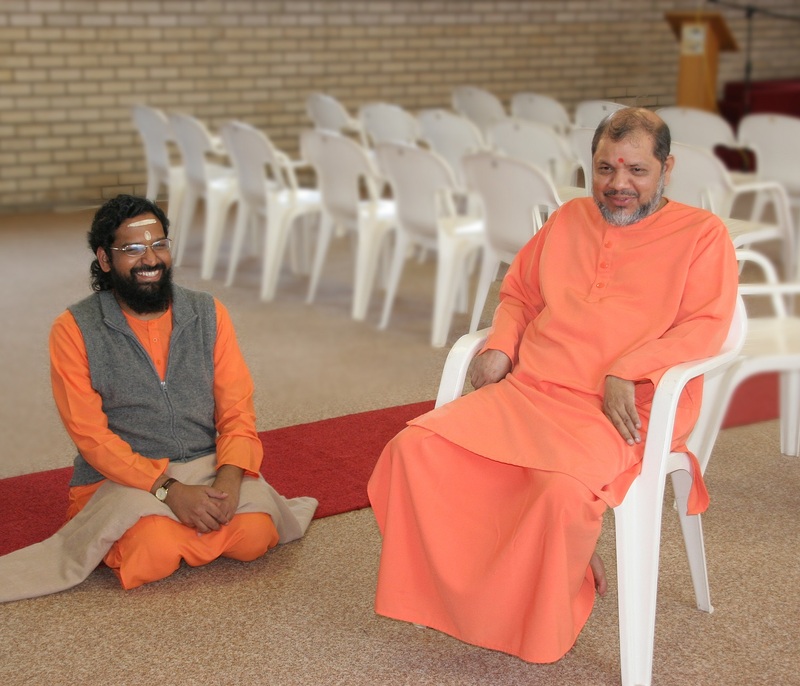 Thanks to the arrival of Swami Abhedananda, for the Chinmaya Mission ashram in Durban, it has only been an upward growth curve ever since Swamiji has taken the pilot’s seat and steered the ashram to newer heights of spiritual vigour. Swamiji started conducting satsangs and talks on Vedanta, Bhagavad Geeta, Ramayan and Upanishads every single day. Every morning would start at 4 AM witnessing a rigorous routine as Swamiji offered Rudrabhishek Puja in the temple for over two hours. Devotees would come and gaze in awe as Swamiji bathed Lord Shiva with buckets of milk, only to appease Him and seek divine grace for the benefit of the ashram and it’s devotees. Daily morning talks on Vedanta and evening satsangs on Ramcharitmanas or Bhagavad Geeta became the hallmark of the ashram, as Swami Abhedanandaji uncompromisingly took classes everyday even when there were only a handful of listeners in the early days. Besides the satsangs, Swamij started guiding several other reach out programs and touching lives of new devotees. In a span of few years, the ashram has seen immense progress. Today the centre is buzzing with several activities like regular Classes, Gyan Yagnas, Study Groups, Chinmaya Yuva Kendra, Balvihar, celebration of all important Hindu festivals, Public talks and even mass media talks of Pujya Swamiji which are telecast through channels like Radio Hindvani and Africa TV. The Mission also has its presence in Johannesburg and devotees from Jo’burg also visit the Durban ashram for attending several programs. Hundreds of devotees now throng the ashram for attending satsangs / talks and participate in the various programs like Vishnu Sahasranama Puja, Gayatri Havans or Monthly Yagnas. Today, the centre has been operational for over two decades, flourishing and growing like never before. With the blessings of Pujya Swami Tejomayananda, the Chinmaya Mission Durban has taken the next big leap by hosting the first ever Two-Year Residential Vedanta Course for the detailed Vedanta studies. Please read through the details about the ongoing Vedanta course in an exclusive article in the activities section ahead. 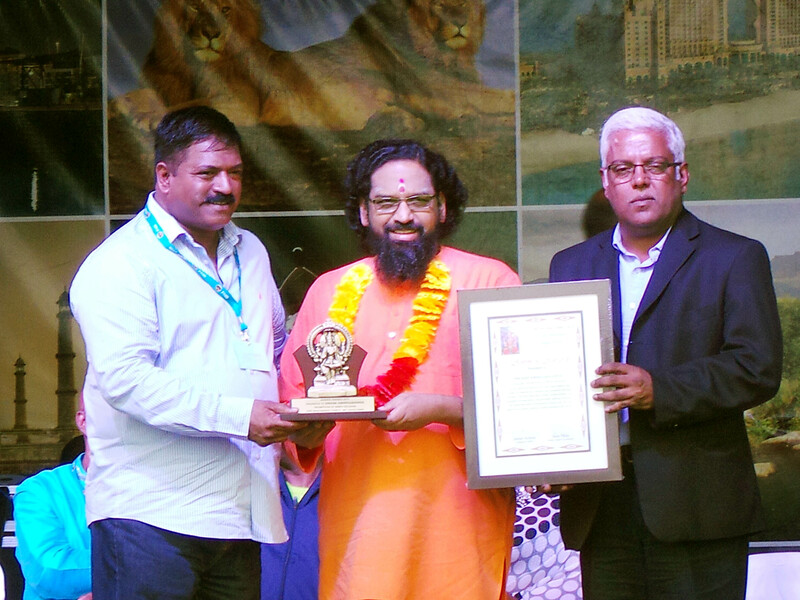 For his tireless efforts towards reinvigorating Hinduism within the boundaries of South Africa and beyond, Swami Abhedananda was aptly hailed as a “Beacon light” during a recently concluded award ceremony in Durban. More than 20,000 people from all walks of life witnessed this award ceremony organised by Shri Mariamman Temple Society. They lauded Swamiji’s selfless vigor and spiritual zeal for bringing a widespread spiritual awakening among the citizens of South Africa. Swamiji’s dynamic address to the audience was received with a thunderous applause and it was a momentous occasion for all the devotees of Chinmaya Mission South Africa. Brahmachari Abhijit Chaitanya who arrived in October 2013 after successfully completing the two year Vedanta course, has also been devotedly assisting Swamiji in the Ashram activities and classes. Brahmachari Abhijit Chaitanya had first been introduced to the Chinmaya Mission during Ramayananda talks delivered by Swami Abhedananda in 2008. He was immediately captivated by Swamiji’s deep love for the Lord and his divine insight into the scriptures. 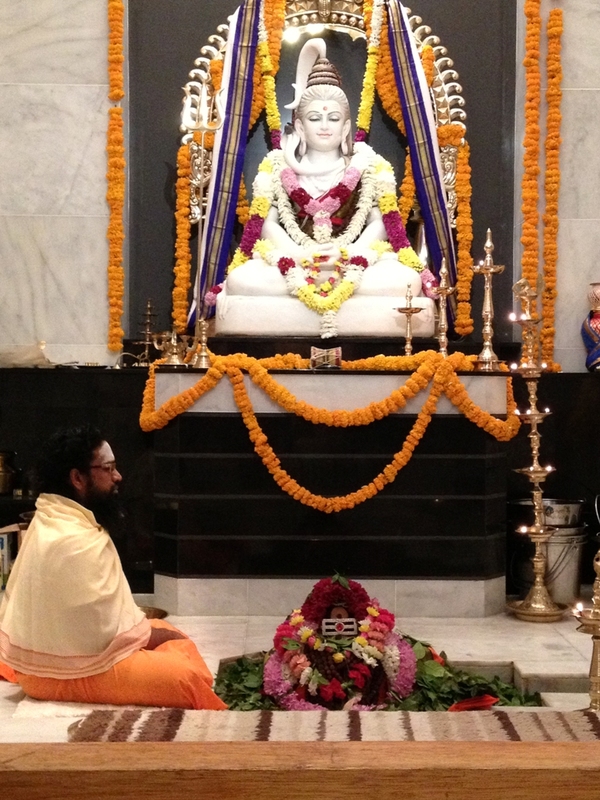 Thereafter Abhijitji started attending regularly, the classes and other activities of the Ashram. 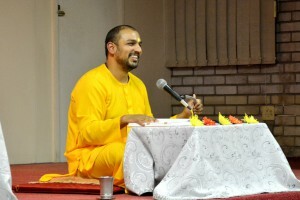 Abhijit then studied the scriptures full time when a Six-month Residential Vedanta course was conducted by Swami Abhedananda at the Durban Ashram. Not long afterwards, he took the blessings of Pujya Swami Tejomayananda, to attend the 15th Batch of Two Year Vedanta Course at Sandeepany Sadhanalaya, India in August 2011. After completing his studies he was conferred Brahmcharya deeksha and was posted to Chinmaya Mission Durban, South Africa where he currently serves the Mission under the loving guidance of Swami Abhedananda.